Near the city of Samara river Volga makes an awesome turn making almost a complete circle. Samarskaya Luka National Park covers most of the peninsula formed by the 180-degree bend of the Volga River as it flows around the Zhiguli Mountains, near the cities of Samara. We challenge you to swim 100 miles in 5 days – as part of a relay team, or even the solo. This will be the only one race where you make a circle of 100 miles swim and finish where you started 5 days earlier. There is Zhiguli Natural reserve inside the band. Soviet beer was named by this natural phenomenon. This is also the homeland of the famous Russian bard songs festival - Grushinsky festival. 100 miles unique natural landscapes of the Samara bend, 100 miles challenge your limits , swim 100 miles trip around the world. 5 days long adventure. Every day you will have to complete a journey of up to 22 miles, to spend a night in a the camp and stay the course to the finish line. There are 2 options for participation: team relay race (4 to 6 people) or solo. Every evening you will have not only magnificent views of the Samarskaya Luka and delicious food on a fire, but also motivational lectures, singing songs on Grushinsky meadow, excursions and swimming workshops. Use Telegram app to chat with other participants https://t.me/xwaters_samara (open from your phone when the app is installed). The swim starts on the longest promenade in Europe, where participants start their journey of 100 miles. Every day they are swimming down the river for 16-22 miles. Every nights they stay on the wild Islands and at the foot of the mountains. The relay ends at the start point on the waterfront of Samara, where the finish town is located. Each day, the participants swim along the route and replacing each other. The team follows the swimmer on the boat. Each swimmer of the team must be in the water for at least 30 minutes a day. The participants decide themselves about the sequence and the distance for each swimmer. Solo participation is an ultra marathon for the most persistent. 181 km - time for yourself and the largest river in Russia. All the way you will be accompanied by boat. A unique area formed by the bend of the largest European river Volga. There are about 200 natural and historical attractions on Samarskaya Luka. One of the most interesting is the Muromsky Gorodok which is the largest settlements of Volga Bulgaria IX - XIII centuries. History of Samarskaya Luka is closely associated with the famous historical figures - Stepan Razin, Yemelyan Pugachev, Lenin and Maxim Gorky. They were also passed this journey of the Zhigulevskaya around the world. - The relay team will be provided with a boat for 4-6 people and life jackets. You have already registered for the swim. Your name* This name will be on the gift. You already have a discount for this swim, so you can not enter a promotional code. I have read Swim Regulations, Standard contract and Information on payment by bank card, and have no objections. I agree that the Organizer will store and process my personal data provided by me for organizational purposes. 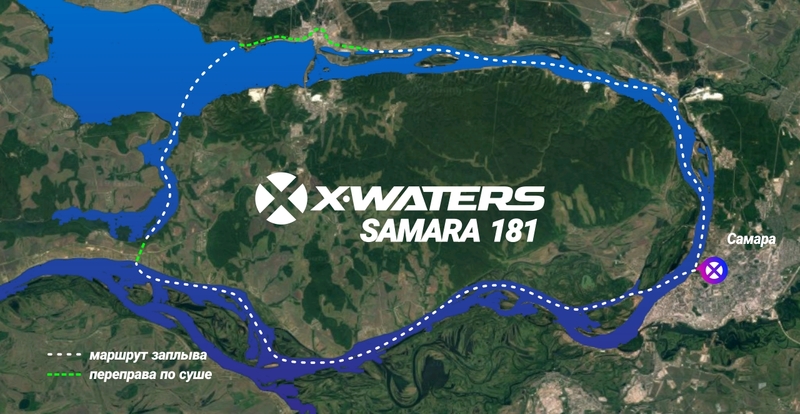 Start at 8:00 am from the main embankment of the city of Samara. Finish from 2:00 to 6:00 pm. Evening cultural program and dinner. Finis from 6:00 to 8:00 pm. Leave boats and walk 1,5 miles on “Perevoloki” to the camping. Boats are transported by volunteers. Distance: 18,3 miles to the camping. Finish from 4:00 to 6:00 pm. At 9:00 am you leave camping by bus, passing the damn and continue the swim from Togliatti. Distance: 11 miles to the Festival (Grushin) meadow. The finish from 3:00 to 6:00 pm. The award and Champions dinner. Each volunteer becomes a full member of the X-WATERS team. Volunteers of our starts receive a unique experience in organizing major sporting events and, on an equal basis with the organizers, interact with the participants of the starts at the most crucial stages. We guarantee the most positive and vivid emotions, as well as the gratitude of the swimmers, whom you help to reach the goal. Bonus: branded X-WATERS T-Shirt. We are waiting for your applications! Bonus: brand t-shirt X-Waters. Waiting for your requests!